Whether you have a mini brewer or the top model, descaling your Keurig keeps the brewer running at peak performance. Your Keurig coffee brewer will benefit from regular maintenance. The scale buildup that occurs with use can cause the brewer to operate at below optimal temperature and can affect taste. Although the process might vary depending on the Keurig model you want to descale, the process of running either vinegar or descaling fluid through the brewer and flushing with water is the same for all the brewers. Descaling every three to six months ensures your coffee will always be perfect and your Keurig will provide years of service. Pour vinegar into the brewer's hot water tank up to the fill-level mark. Place the ceramic cup onto the drip tray. Ensure the lid is closed, and then execute a brew cycle. Pour the contents of the cup back into the water tank. Perform the second brew, but switch the brewer off immediately when the liquid begins to dispense. Let the machine stand for 30 minutes before continuing the brew. Pour the contents of the cup down the sink. Measure 8 ounces of bottled water. Fill hot water tank. Perform another brew, ensuring the ceramic cup is in place. Pour the used water away. Repeat this process three times. Note: bottled water is specified in the manufacturer's directions; therefore, avoid using tap water for descaling this model. Turn off and unplug the brewer. Take the brewer to the sink, keeping it upright. Undo the drain cap and remove the charcoal filter. Position the drain over the sink and allow the water to drain. Replace the drain cap. Plug the brewer back in and turn it on. Fill the brewer with vinegar until the tank-full indicator beeps. Allow the vinegar to heat up until the green light comes on. Place the ceramic cup in the drip tray and press the Brew button. When the brew cycle is complete, pour the vinegar back into the brewer and repeat the process four or five times. Pour the final cup of vinegar back into the brewer. Allow the brewer to stand for four hours, leaving it switched on. Carry out four more brew cycles, each time disposing of the cup contents. Turn the machine off to allow the remaining vinegar to cool. Drain the brewer as in Step 1 of this section. Fill the brewer with hot water and run the brewing process five times with the ceramic cup in place. Drain the brewer. Repeat this process if there is any residual vinegar taste. Replace or renew filter. Empty water from the reservoir, and fill it with vinegar to the top edge of the viewing area. Place the ceramic cup on the drip tray and press the Large Cup button. When the cycle is complete, dispose of the cup contents. Repeat until all of the vinegar is used up. Fill the reservoir with fresh water and allow to stand for four hours with the machine switched on. Put the ceramic cup on the drip tray. Press the Regular button. Repeat the brewing process, discarding cup contents down the sink, until the water reservoir is empty. Repeat this process if there is any residual vinegar taste. Descaling solution can also be used instead of vinegar. Take care when disposing of hot vinegar and water. Never use a plastic or paper cup when descaling. Descaling is always carried out without using a K-Cup. Beverley Gee began her freelance writing career in 1982. She earned a National Diploma in information technology and business studies at Coleg Glan Hafren, Cardiff, U.K. She has written for several U.K. publications including the "South Wales Echo" and her local newspaper, "The Diary." She is also a qualified reflexologist. 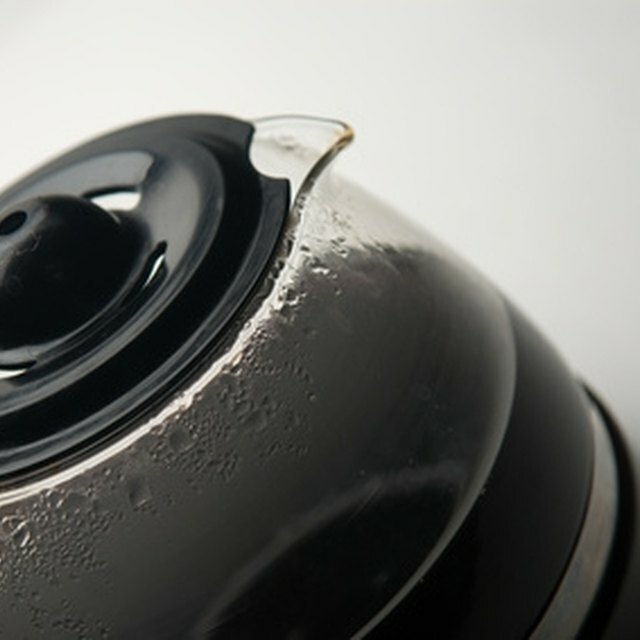 Why Use Cold Water in a Coffee Maker?